Ducksoup has to be the most interesting restaurant name to hit London in recent times, at least I think so anyway. Brought to us by a team of people who previously worked at the Hix chain of restaurants (chef Julian Biggs, Clare Lattin and Rory McCoy), it adopts a similar formula to the one tried and proven in the Russell Norman empire (Polpo, Polpetto, Spuntino, da Polpo) of great location (Dean Street), no bookings except at lunch (very annoying), and reasonably priced food (always appreciated). But Ducksoup’s approach is slightly more no-frills, so much so that paper napkins come from paper napkin dispensers. The décor is also simpler. It’s comfy, but cool like Spuntino it is not. There are a number of bar food options, mostly at £3.50, which is great value for this part of town. From the daily changing hand written menu (dotted with a few spelling mistakes) we went for the bar choice of bitter greens with gorgonzola. 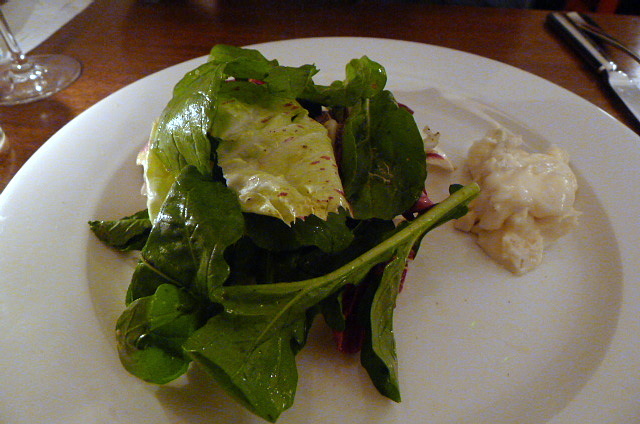 This was really impressive with the greens being fresh, crispy and nicely dressed. The gorgonzola was creamy, rich and served at the correct room temperature. 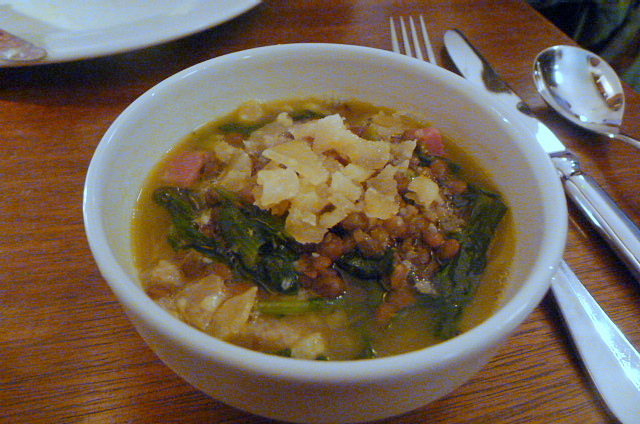 A cavolo nero (an Italian cabbage), Serrano ham and lentil soup (another bar option) was delicious with a rich, sweet and well balanced flavour. 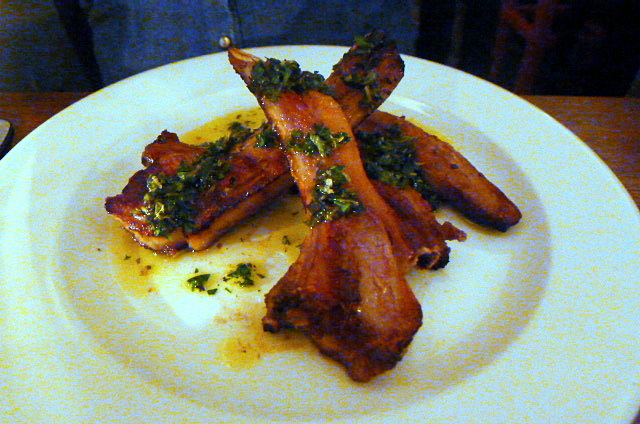 A dish of lamb cutlets (£14) was nicely cooked and tasty, and the accompanying salmorigio (a Southern Italian condiment similar to salsa verde typically served with grilled meat) was lovely and worked well with the lamb. But the dish came with no vegetables and felt imbalanced. 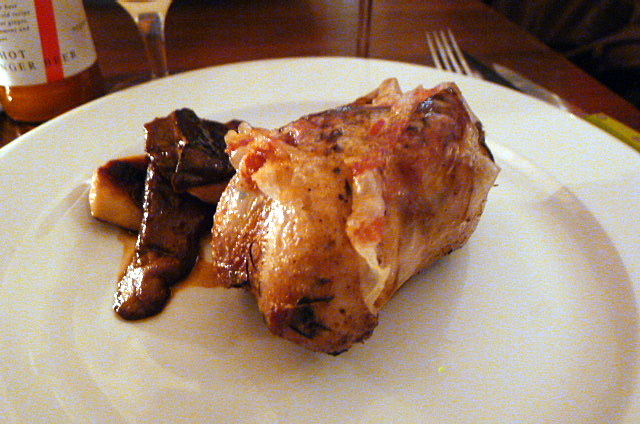 A dish of partridge (£18.50) with ceps and guanciale (an Italian pig’s cheek bacon) was rustic and hearty. The guanciale was tasty and highly enjoyable. But again the dish needed more veg to balance out the dish. 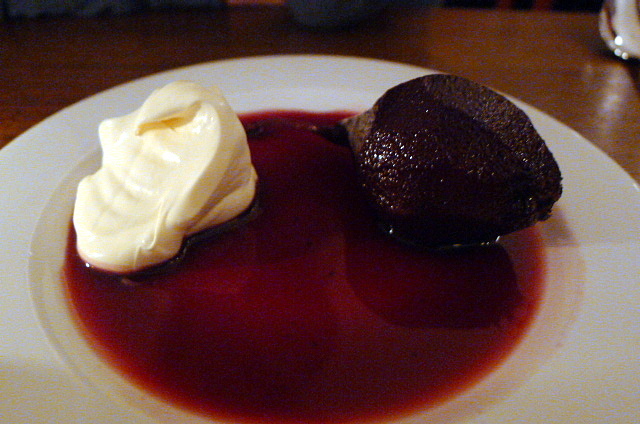 A dessert of Martin pear, barbera and crème fraiche (£5) was pleasant, but the pear could have been poached for longer for a softer texture. But the mains lacked the necessary sides and finishing touches to make the meal complete. It is rather difficult to eat just meat with not much else to go with it. There aren’t side dishes for the offering either. This lack of well-roundedness meant that I liked the idea of Ducksoup more than I liked the execution itself. The service was also a bit uptight with one particular waitress constantly checking in on us to the point where it became very annoying. The cooking is very good though, so if the mains were to become more balanced it could become be a truly fantastic eating hole. Wishing that the partridge was on the menu when we went- we had a few things to pick at over (quite a few) glasses of wine- but didn’t really indulge in a full meal… interested to go back and see how it would flow. The cooking is good, but our meal felt incomplete. Ducksoup probably needs a little more work.